Homemade mill table square and strip. 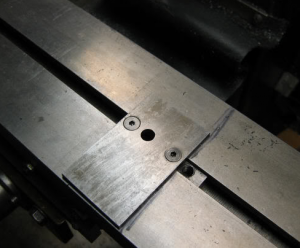 Square is mounted with its sides perpendicular to the T-slot, and perpendicular to the table motion. Table strip has its sides parallel to the slot and runs parallel to table motion. Both attachments have holes for clamp studs and T-nuts.